Woodman’s is a Wisconsin-based supermarket known for being huge, cheap, decorated with ugly wood paneling, and chaotically disorganized but very well-stocked, except in the areas they choose to ignore like butcher & seafood counters. It’s run by crazy low budget tv commercial personality, Phil Woodman. For some reason, Phil Woodman decided at some point to adopt “¡Ay Caramba!” as his catchphrase, likely after becoming too much of an early-90s Simpsons enthusiast. So because of this, when Woodman’s features a particularly incredible deal on one of their large yellow price signs, they sometimes stick a red CARAMBA! sticker on the price tag to draw additional attention among the stacks and stacks and stacks of merchandise. The “¡Ay Caramba!” Phil Woodman catchphrase isn’t in every commercial, but it is notably absent in this one with a Spanish-speaking employee hawking piñatas and Jumex drinks. 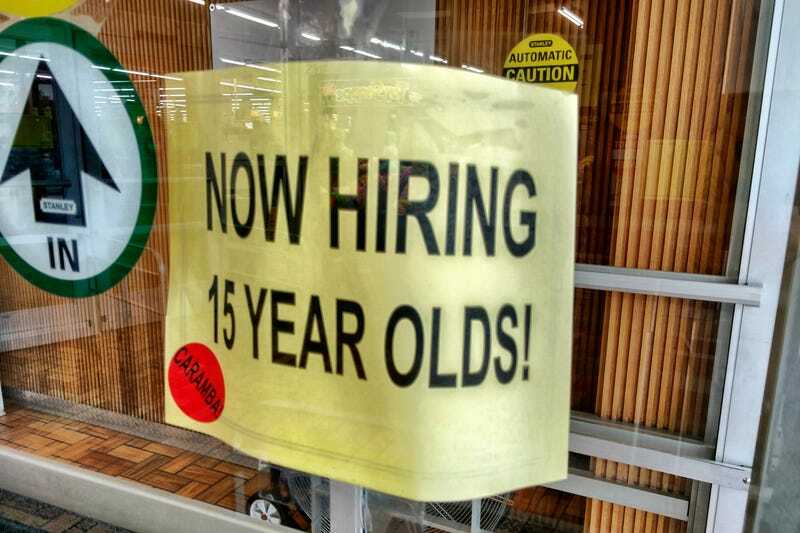 I love me some Woodman’s, because it’s damn cheap, has lots of good stuff, and I appreciate Phil’s brand of crazy, but I can’t help but think that maybe a sign on the door announcing your willingness to hire 15 year olds in your store is not the best place for a bright red CARAMBA! sticker?